After much searching we belive we have got the boat best suited for our courses. 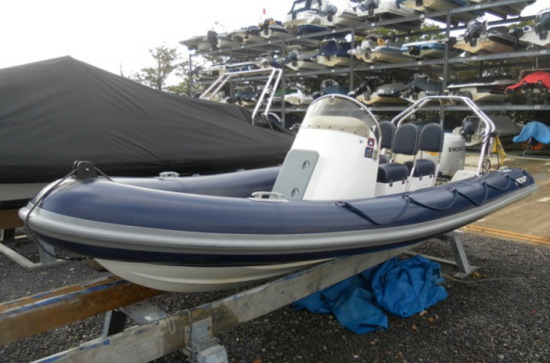 The reason we went for a RibCraft 585? The feedback we got from students was they realy enjoyed learning on a small boat. Being able to turn it around in a tight space the with the freedom and response you get from a small boat. This feedback came form all across our canadidates; mothers, daughters, dads, sons and grandparents. However, the RYA scheme is moving on and our Ribtc 4.6 was getting old and wasn’t able to run the Advanced Scheme Sylabuses. 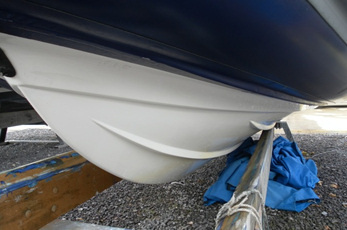 The decision was made to not only replace the Ribtec but to replace her with an Advanced Boat which is a commercially coded to MCA/RYA standards. The hard bit keep it small enough that we don’t loose the enjoyment and learning advantage we had from having a smaller boat. So after discusions with people in the indusrty and advice from the RYA Training Department the Ribcraft 585 was the chosen boat. We wanted a boat with all the equipment and a good deck layout. 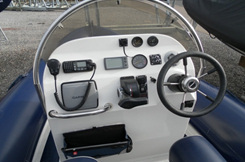 Centre Console with side by side seating with Chart Plotter, VHF DSC Radio and Echo Sounder. All within easy reach and site of the students and / or instructor. Wind screen for keeping you dry and warm. This is possibly most important part of the new industry coding and improved standard and nicer for those of us who are getting older. Carrying of equipment safety equipment Life raft and auxiliary engine. Deep V hull for a Smooth ride the well know Ribcraft Deep V hull is well regard in the industry as one of the best design of hulls. 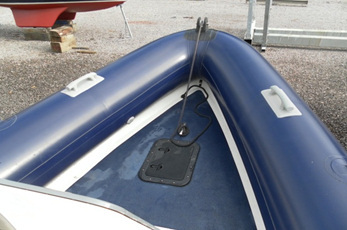 Good for cutting though a rough sea but also giving a stable ride at speed on flat water. Powerboat Level 1. 8-10 year olds (Junior scheme). Powerboat Level 2. Suitable for ages 12+ World renowned Course Often referred to as the driving Licence of the sea but also the corner stone to the whole of the syllabuses). Intermediate Course. A great course a good progression course (Sadly not enough run). Advanced Powerboat Course. I believe the best course the run driving a rib at night at high speed using all available navigation to find unmarked points. Super Yacht tender Course. A new course which has been developed through industry demands designed for the Superyacht industry. 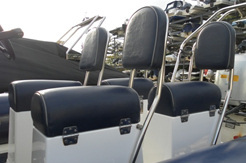 We hope we have chosen the right boat for our customers and Candidates requirements and needs.